As well as enabling millions of children to learn in homes and informal refugee settlements, SAT-7 ACADEMY is making a difference in classrooms. The channel will soon be used in two very different educational settings in Lebanon: the Cultural Heritage and Interactive Learning Development (CHILD) Centre for refugees, and a local private school. The CHILD Centre opened in November 2017 and is already proving an important tool for the development of SAT-7 ACADEMY. “When dealing with education, it is very important to have a results-based approach,” says Nicoletta. “We must monitor, measure, and evaluate the success of the programs we design.” At the facility, children learn from programs based on all three of the channel’s ‘pillars’: education – provided by the My School curriculum – health, and social development. “I see the centre as an extension of the channel,” Nicoletta explains. Working with the cultural organisation Biladi, SAT-7’s local implementing partner on the ground, has enabled SAT-7 ACADEMY to adapt to its viewers’ needs. After learning more about the attention spans of children who have never been to school before, the team have shortened My School episodes to 15 minutes and integrated more storytelling, which helps develop listening skills. The channel will also have a greater focus on motor skills after it was observed that some students had never learned to hold a pencil. The team hopes to gain further insights when parents begin watching programs especially for them. But the CHILD Centre is not only helping to improve existing shows – it is inspiring new ones. In response to the discovery that some children could not say which country they came from, new content will celebrate viewers’ cultural roots. SAT-7 ACADEMY is also hoping to adapt an impactful healthy-eating and hygiene workshop for television. “From the few people participating in the workshop, we will scale up the program and bring it to millions of viewers,” Nicoletta says. Nicoletta is also very excited about a second partnership. Early in 2018, nine teachers at a local Lebanese private school will learn to use SAT-7 ACADEMY’s multimedia content. For a formal accredited school to recognise the quality of the programs is very significant, especially as the channel has been on air for a short period of time. 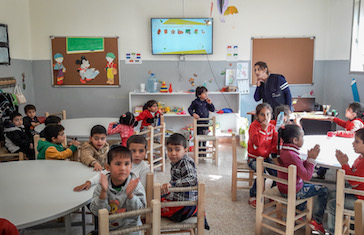 SAT-7 ACADEMY is reaching out to other partners who could use the channel in similar on the ground initiatives – perhaps by screening programs for children while their parents receive support, or by integrating shows into refugee schools to help children who are not ready for formal lessons.